What Size Bike Do I Need For My Child? | Kids Bike Size Chart Guide. Knowing your kid’s exact bike size is an essential part of buying him/her an ideal bicycle. But what exact bike size does your child need? The thing with children bicycles is that unlike adult bikes where we size by frame and a bike’s seat height, we use the diameter of the wheels to measure a kid’s bikes. So, what size bike do i need for my child? Generally, children between 3 and 4 years can comfortably ride bikes with 12 inches diameter wheels while kids aged 4 to 5 years can use 14-inch wheels comfortably. If your kid is between 5 to 6-years, he/she will need 16-inch wheels and 18-inches if the child is 6-8 years. 20-inches work just fine for most 7-9 years old while a bicycle with 24-inch wheels is ideal for children between 9 and 11 years. Lastly, 11-14 year olds can use the adult-sized 26-inches. Since some of the ages may overlap, your baby’s height and inseam may also be influential. Why Should You Get The Right Fit For Your Kid? The keyword here is your baby’s comfort and safety. Too tiny a bike is pretty disconcerting and sometimes a pain. If, conversely, it’s oversize, he will struggle to control it. Finding the right bicycle size before you go shopping also saves your time and helps you avoid the inconvenience of having to return it to the store. So, how do you determine the most fitting wheel-size for your youngster’s bike? Though there are other ways, you rarely get it wrong with bike size chart kids. A Guide to Bike Size by Age. 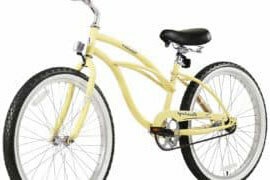 As you have seen, sizes start at 10-inch and increase by 2-inches ending with 26-inches diameter wheels. The dominant wheel sizes for kids are 12-inches, 16-inches, 20-inches and 24 inches for various ages. Kids aged 4-years are at home in bikes with12 inches diameter wheel sizes. However, you should make sure that he/she is able to touch the ground with the feet comfortably when mounting the bike. This gives him/her proper control and balance. 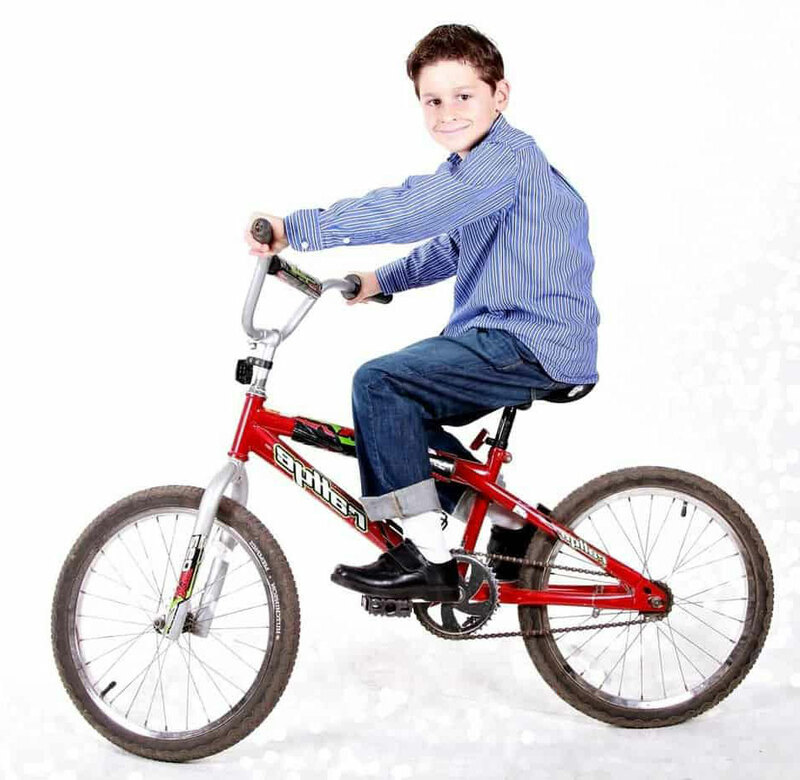 At 5-years old, your youngster can use a bike with14 inches diameter wheel sizes perfectly. The most important issue is to observe how well the child rides and whether he looks easy and in control. If your boy/girl is 6-years, we recommend a 16-inches bike. Again, as you will learn later, you can also look at his height and inseam to ensure you get it just right. But generally speaking, 6-year olds excel with 16-inch wheel bikes. For a 7-years old, consider an 18-inches bikes. But the decision isn’t straightforward because in some cases- especially if he/she is a bit taller, you may notice that he looks more relaxed with a 20-inches wheels diameter bike. Indeed, a 3’8″-4’0″ tall is far much better on an 18-inches while if he/she is beyond 4’0″ but doesn’t exceed 4’5″, a 20-inches will be the best bet. If you aren’t yet satisfied, you can check his step length (inseam) in the boys bike sizes or girls bike sizes inseam charts. From my own experience (I have an 11-year old daughter), 10-year old girls find 20-inches bikes comfortable and safe. But if she is more than 4’5″ tall, let her try a 24-inches bicycle. Provided her feet are touching the ground and she looks fine, it might turn out to be the ideal feet. Most 12-year-olds are ready to hop onto a 24″ inch wheels bike, which is like a miniature adult bike. It comes with more gears than 20-inches bikes and a longer wheelbase to accommodate its larger wheels. And like most adult bicycles, it has some form of suspension (front or rear). But if your child is 5 inches and taller, you need to compare a 24-inches with a 26-inch bike. The later tends to fit taller youngsters much better and could deliver improved comfort. The best way to ensure precise measurements is by also considering your baby’s height and even inseam. Kids Bike Size Chart By Height. Let him/her remove their shoe then stand straight, their back firmly against a wall. On their head, place a book such that it’s touching the wall. With the heels still on the floor, mark the point where the base of the book (on his head) touches the wall. Now let him step away and take the measurement from the floor all the way to the mark. That’s the height. The question of what size bike do i need for my child can also be answered by basing the measurements on the inseam. For starters, the inseam is your kid’s inside leg length and captures the distance/length from the floor and your baby’s crotch and helps in knowing whether your young one can comfortably touch the surface with both feet without modifying his/her bike’s saddle height. This is one of the measures that are very necessary when assessing the child’s safety when riding and the correct bike fit. Have him first remove the shoes (socks can remain). Then, let the child stand up straight, his legs apart (slightly). Using your measuring tape, measure and record the length (in inches) starting from just below the crotch all the way to the bottom (of his ankle). That is the inseam. If possible, let him stand with the back up straight against a wall. Placing a book between his legs (as if he is seated on his bike’s saddle) can help improve accuracy. How Tall Should My Kid Be To Ride A 20 Inch Bike? To ride a 20 inch bike, your kid should generally be between 4 and 4’5 inches tall. Also check his inseam (22”-25” is quite at this height) and other things like the structural design. Better still, some of the models at this range are multi-speed and come with outstanding hand brakes making them fast but safer. All in all, you should get a bike that will excite him/her to ride while remaining safe. How To Determine The Right Frame And The Wheel Size For Your Kid’s Bike. Despite what you may have heard, guides and charts just help to point you towards the right direction. If you can, the best way to size it is to have your baby sit on the bike on a test ride then you watch his/her demeanor. That’s how to tell if the frame and the wheel are a perfect match for your baby. Otherwise, there are no frame sizes specified for children bikes. For the wheel size, take the necessary measurements and look them up in the kid’s bike size charts. Still there, a robust frame guarantees stable handling and is safer even when on bumpy terrain. Additionally, athletic wheels are generally easier to maintain. An adjustable saddle is great because by raising it, the angle of the rider is also elevated as well as the important distance from the saddle to the handlebars. Even the distance to the pedals increase. This means that the bike can ‘grow’ with your child and continue to fit him/her longer. A balance bike is the best option for your kid during the very early days when introducing him/her to the world of wheels while at 2 years, you can upgrade to a 10-inches bike. Otherwise, children between 3 and 4 years are fine with 12 inches diameter wheels while at 4 to 5 years, they can perform with 14-inch wheels comfortably. And if your schoolboy/schoolgirl is 5 to 6-years, a 16-inch wheel kid’s bike is the way to go. Now, an 18-inches bike is superb for children between 6-8 years as is a 20-inches bike for most 7-9 year olds. Finally, a 24-inch wheels bicycle is awesome for babies 9 to 11 years while beyond 12 years, you will be looking at the adult-sized 26-inches. Lastly, 14-inches and 18-inches wheel sizes aren’t common in the market meaning that if you find that it’s what your child needs, you will perhaps have to explore the neighboring sizes.